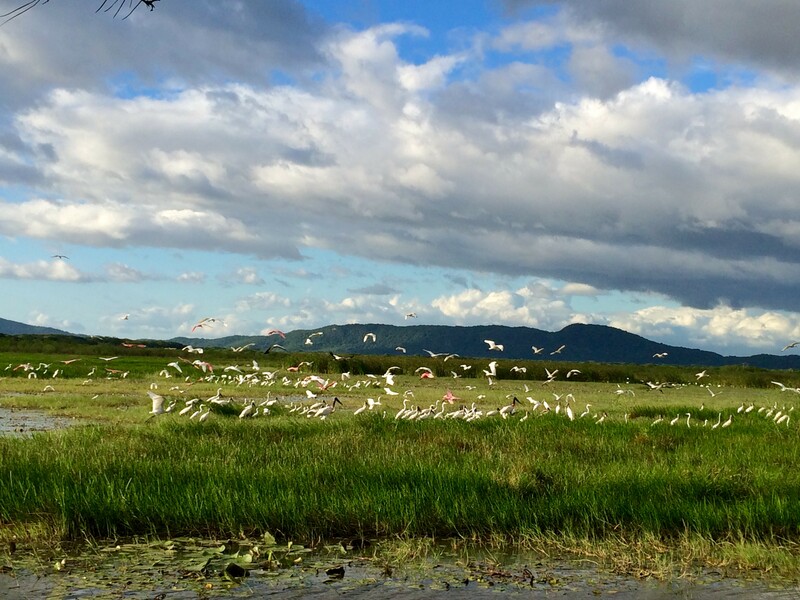 The Costa Rica’s Birding Hotspots Route, protects 119 000 acres (4800 ha) of bird ecosystems in Costa Rica through the network of preserves of the lodge members. One of the requirements for participating in the group under the Birding Hotspots Brand is having a reserve, participate in biological corridors and being part of one of the Important Bird Areas of BirdLife and the buffer zone of other important protected areas of the country. Twelve hotels with their own reserves are now represented in 12 hotspots for the best birding in Costa Rica in the 5 great eco-regions for birds and wildlife of the country. More than 10 ecosystems are protected in this birding initiative that involves properties around the whole country. All this properties are based in ecotourism activities and some of the combine it with sustainable farming, environmental services and conservation. Wetlands of the Rancho Humo preserve, that shares boundaries of Palo Verde National Park is one of the ecosystems we protect. Key habitats for very special and threatened species of birds, such as the mangroves and wetlands for the endemic to Costa Rica Mangrove Hummingbird in the Tempisque River, Cloud forest areas where the wild avocado (main diet for the Resplendent Quetzal) is abundant, feeding areas and sites that are part of the ancient paths of the Nearctic migratory species as the Golden-winged Warbler, hotspots for wintering ducks, and special areas for finding some of the most amazing birds of the Neotropics including the remarkable Snowcap hummingbird, Fiery-billed Aracari, the endemic Black-cheeked Ant-tanager, the bright Scarlet Macaw, the elegant Jabiru, and many more, are just samples of the impact of our project in terms of conservation. The land of the network of reserves of the Birding Hotspots project, represents represents almost 0,1% of the surface of Costa Rica, and 0,34% of the protected land of the country. pieces of paradise for the birds and many other wildlife creatures, as well a haven for the lovers of our feathered friends. All the properties of the initiative have sustainable programs, support local communities, buy local products and hire local staff, educate people and preserve the main resource of the country, nature, our green gold. So every time you choose one of the Birding Hotspots lodges, you can trust that is a super birding area and as well that part of the money you are paying to be there, is going to conservation and that you are spending some of your birding time in some of the most breathtaking locations of Central America, from the foot of active volcanos, the highest mountains of Costa Rica, valleys, coasts, Peninsulas and lowlands. Feel in love of the birds with us and get amazed by discovering the best locations for birdwatching in Costa Rica. The hotels in the network are: Esquinas Lodge in La Gamba Golfito (37 acre/15 ha), Cristal Ballena Boutique Hotel in Bahía Ballena (30 acre/12 ha), Macaw Lodge in the Carara & Turrubares hills (1000 acre/400 ha), Rancho Humo Estancia in the Tempisque River & Palo Verde national Park (2718 acre/1100 ha), Tango Mar Hotel in Nicoya Peninsula (150 acre/61 ha), Hacienda Guachipelin in Rincón de la Vieja Volcano (3400 acre/1375 ha), Arenal Observatory Lodge in La Fortuna & Arenal (870 acre/352 ha), Rainforest Adventures Nature Lodge in the foothills of the Braulio Carrillo & Sarapiqui lowlands (1200 acre/475 ha), Manatus Hotel in Tortuguero (50 acre/21 ha), Rancho Naturalista in Turrialba (125 acre/52 ha), Selva Bananito in the South Caribbean (2000 acre/850) and Paraiso Quetzal Lodge in the Talamanca highlands and Los Quetzales National Park (198 acre/80 ha).